Try this simple new way to serve sushi! PLACE 4 cups spinach leaves in glass bowl. TOP with one layer of each of the following; 3 cups (1-1/2 cups dry) cooked and cooled instant white rice. 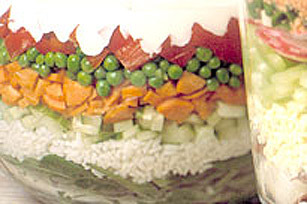 1 chopped English cucumber, 5 chopped carrots, 1 cup thawed, frozen peas and 1 sliced red pepper. COMBINE 1 cup each MIRACLE WHIP Dressing and sour cream. Spread dressing evenly over salad right to the edge of the bowl. Instead of frozen peas, you could substitute 2 chopped avocados.